The buttons, they are enough to drive one batty (see previous post). What’s worse than sewing on 21 buttons? Having to rip out a bunch because someone didn’t space them correctly. In spinning – I finished up the Nectarine wool, and it is beauuutiful. It’s 288 yards, and very similar to the sherbet merino I did up earlier. I think I’ll try to combine them in a project somehow. I’ve also started a new project. 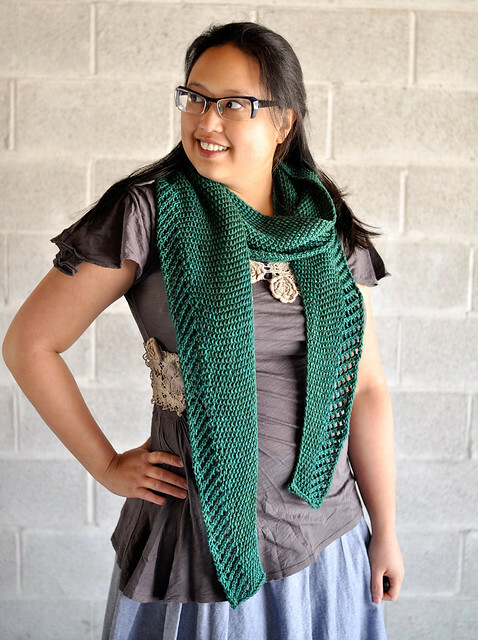 Yep, an OSW – but it’ll take more than one skein, because I’m going to put sleeves on it. I’m using Knitpicks Shine, and it’s so soft and lovely! Plus, it doesn’t split – no more splitty yarns for a while, thanks. P.S. It’s done. It fits. It’s gorgeous. Pictures soon. Thanks for all the compliments on sapphire guys! I really appreciate it. Always eyes forward, I’ve finished knitting the ribbed corset. Here it is blocking, very stretched. It’s more promising that it’ll fit now, but still a bit iffy. The stomach area is fine, but the bust could be…er…flashy? At any rate, I’m going to put the buttons on and then see. I haven’t even woven in the ends yet. I hate those little metal things that hold the buttons onto the card. I’ve been using a staple remover, but it doesn’t work all that great – one of those sharp corners (on the metal thingy) poked me under the nail! After that, I had to go hunting for a pair of pliers. Luckily I found them, and now all buttons are liberated. I finally got to a bit of spinning, and I navajo plied for the first time on some random singles that had been sitting on the bobbin for awhile. It’s VERY overtwisted, but that’s ok. It was just an experiment – it’s very cool. Will definitely be doing it more. In stash enchancement, Lorna’s Laces Shepherd Sock in “Watercolor”. I think I’ll do the “go with the flow” socks with it. One waving lace sock down, one to go. I think the second one will go faster. I think I’ll start a new, plain sock with some of that knitpicks yarn – something to knit while reading! A shot of the cable on the side. Notes: This tank went pretty quickly for 3.5 mm needles! I love the yarn, which was cotton, viscose and silk. I definitely could’ve made this tank smaller, but the fit’s not bad as is. I used a double slipped stitch edge on the armholes and straps, outlined in Annie Modesitt’s Spencer jacket pattern. All in all, not bad. Not the greatest, but not bad. In other news…I went crazynuts with Knitpicks. That’s Shine in Cloud (grey/silver) and Orchid (fushia), Sock Landscape in Yukon (the one in hanks), and Sock Garden in Zinnia and Star Gazer Lily. They feel sooo nice! Plans? A 3/4 sleeve pullover out of the Cloud, a shrug out of the Orchid (since now I’m all tanked out), and of course, socks. I’m alllllmost done the knitting on the silk corset! Now I just have to pray for a blocking miracle for it to fit me. Seriously.